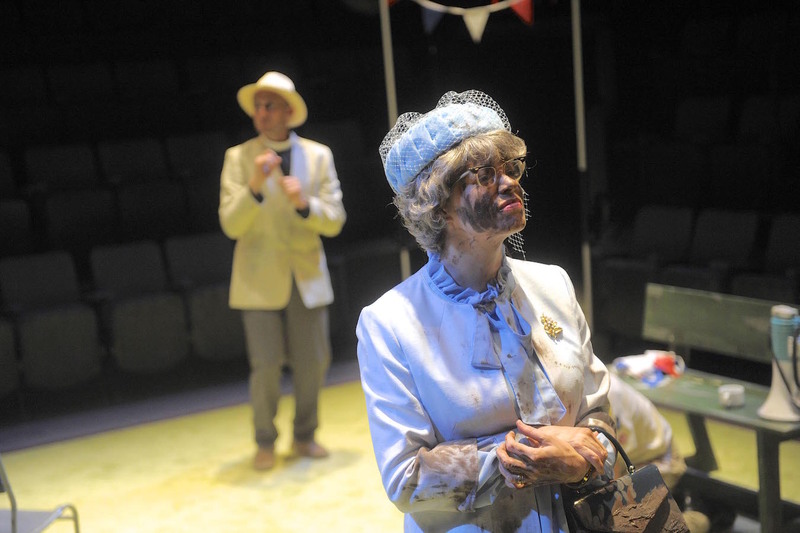 Prolific purveyor of comedies with crisp English accents, Alan Ayckbourn joins the Brits Off Broadway festivities at 59E59 Theaters with two works he’s written and directed. His latest play (79th in his canon), Hero’s Welcome, opens on Thursday, June 9. But one night earlier Confusions, written over forty years ago, receives its New York premier. Confusions consists of five playlets, four of which are loosely joined together but each of which stands on its own. They are character and situation driven, with lots of physical comedy thrown into the mix. They mostly hit their mark with only one major misfire. Mother Figure finds Lucy (Elizabeth Boag) busily caring for three offstage children, only to be interrupted by her grown-up neighbors (Charlotte Harwood and Stephen Billington), who need mothering as much if not more than the young ones. Boag is very funny as the strict disciplinarian, who won’t allow Harwood’s Rosemary to give her husband, Terry, their house key until he apologizes for his bad behavior and drinks his milk. Meanwhile Lucy’s husband, Harry (Richard Stacey), in Drinking Companion, is on the road and on the make. He’s a predatory lounge lizard with his sights on Paula (Harwood) and eventually her friend and co-worker Bernice (Boag). Stacey is brilliant as the slightly slimy Harry, guiding the conversation in one direction and championing trumped-up reasons why Paula should take a look at his room. Between Mouthfuls finds Polly (Harwood) and Martin (Stacey) in the same restaurant as Martin’s boss, Mr. Pearce (Russell Dixon), and his wife (Boag). The link to the previous piece is the waiter (Billington), who’s moved up to the dining room after servicing the lounge in Drinking Companion. 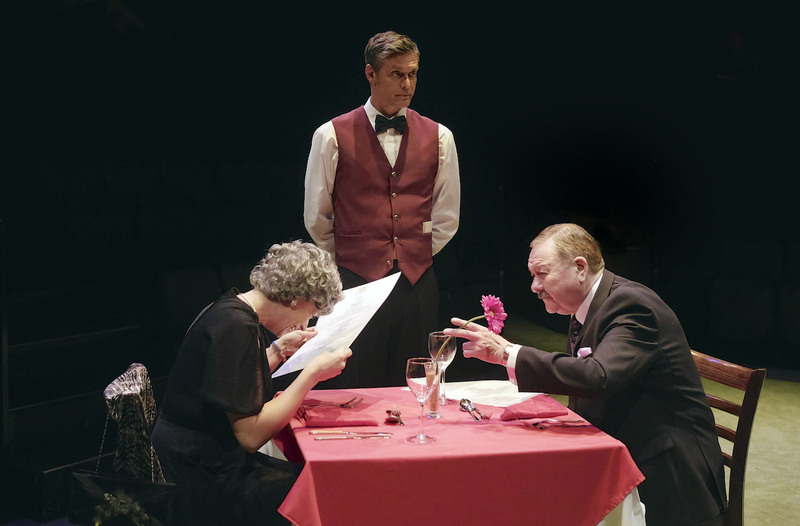 In this play the audience only hears what the waiter hears. When the waiter is not at their table, the couples mouth words but are inaudible. It’s a seemingly clever idea that doesn’t deliver many, if any, actual laughs, but it doesn’t get too much in the way either. Mrs. Pearce sticks around for the next vignette, Gosforth’s Fête, in which she is supposed to be the featured speaker at a fundraiser picnic. But Milly (Harwood), a volunteer in the tea tent, features more prominently when she inadvertently announces her pregnancy over a loudspeaker, making it clear that the father is not her boyfriend. Fête probably has the most effective physical humor, including a muddied Mrs. Pearce oscillating violently due to a wet sound system. Finally, there’s a completely flat sketch called A Talk in the Park that employs the entire cast. Four park benches are occupied by four cast members when out walks Dixon. He joins Hoag on her bench and proceeds to talk her ear off, sending her to Stacey’s bench, where she proceeds to talk his ear off, sending him to Harwood’s bench and so on. Predictable from the get-go, it relies entirely on one joke: each of the characters doing exactly what annoyed them so much they had to move. Nothing in their individual monologues is especially funny. It’s like a game of musical chairs without the suspense or the music. 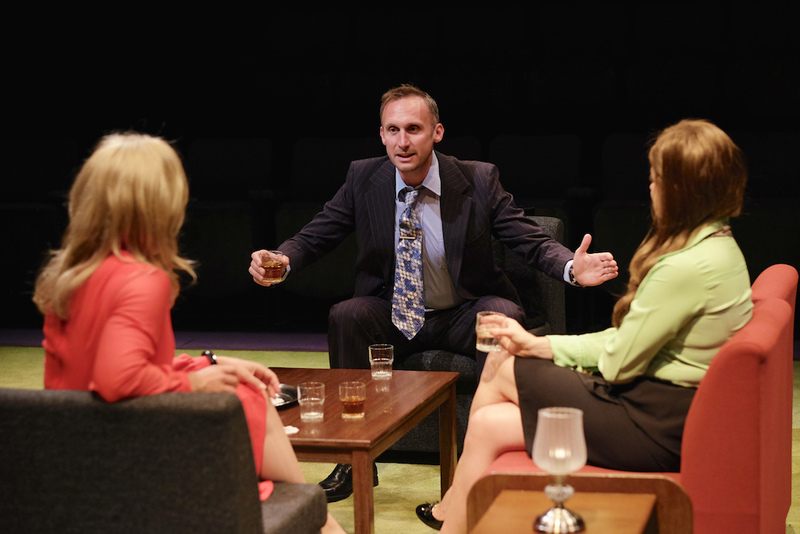 Ayckbourn’s direction is well-paced and unobtrusive. Scene changes are entertaining: mini-production numbers as stage managers and occasional actors rearrange the furniture of Michael Holt’s evocative sets to a jazz accompaniment. Except for A Talk in the Park, Ayckbourn keeps the audience chuckling throughout. His humor is not side-splitting, but it is consistent and his well-drawn characters keep us engaged. Situations are sometimes contrived but we hardly notice. He has a gift for making the outrageous seem like a matter of course. Through Sunday, July 3, at 59E59 Theaters (59 E.59 Street). www.59e59.org. 2 hours 15 minutes with one intermission.